If your pet were in immediate danger, would you be prepared to save their life? Emergency medical care for pets can take a long time to access. When your pet is bleeding, having trouble breathing, or loses consciousness, every second counts. Our Pro Pet Hero program is the best way for pet owners to prepare for medical emergencies. Taught by Katie Casell, our own Pro Pet Hero certified instructor, this fun, interactive program will give you the skills and confidence you need to act quickly and calmly when your pet is having a medical emergency. Why Take The Pro Pet Hero First Aid Course? 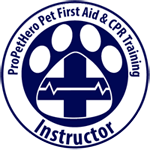 The Pro Pet Hero program is the most comprehensive pet first aid course available. You’ll learn all of the latest protocols in veterinarian-approved pet first aid, CPR and pet safety. Pro Pet Hero is approved and recommended by leading veterinarians, including Dr. Marty Becker “America’s Veterinarian”, emergency medicine veterinarian Dr. Mike LoSasso and house call veterinarian Dr. Lisa Lippman. This program is open to everyone. Anyone can learn pet first aid, and you never know when these life-saving skills will come in handy. We have discounts for professionals and groups. Our group program is ideal for pet professionals like groomers, dog walkers and trainers, as well as EMTs, police, fire rescue, or anyone who might need these skills at home or on-the-job. Are you ready to become an advocate for pet health and safety – and become your pet’s hero?